Welcome to Cvent's Meeting and Event Planning Guide to San Mateo County, written with meeting professionals in mind. Situated on the 60-mile San Francisco Peninsula, which sits immediately south of San Francisco, San Mateo County is bordered on the east by the San Francisco Bay and on the west by the Pacific Ocean. Spanning 741 square miles, San Mateo County encompasses 20 cities on the San Francisco Peninsula, including the City of San Mateo, Burlingame, Foster City, Belmont, Highlands – Baywood Park and Hillsborough. Its popularity for leisure and business travel stems from its picturesque setting, excellent venues and intriguing attractions. Also known as the origin of Silicon Valley, San Mateo County is on the cutting edge of technology and business, a fact reflected in its conference and meeting facilities, modern infrastructure and well-equipped transportation. Centrally located within the county, San Mateo offers an ideal commercial location at the crossroads of three major freeways, with San Francisco to its north, San Jose to its south and the East Bay to its east. San Mateo is surrounded by the San Mateo County's cities of Burlingame, Foster City, Belmont, Highlands – Baywood Park and Hillsborough. Getting to San Mateo County is easy, as San Francisco International Airport, one of the world's 30 busiest airports, is located within county limits. The airport provides direct service to the Bay Area Rapid Transit (BART) Rapid Rail and San Mateo County Transit (SamTrans) bus system. By car, visitors can get from San Mateo County to San Francisco in 51 minutes, Oakland in 1 hr 3 min minutes, San Jose in 57 minutes and Sacramento in 2 hr 13 min. 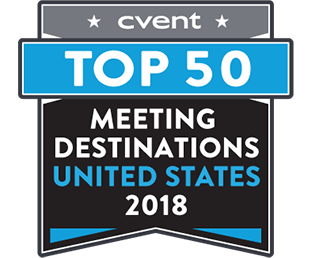 Of particular interest to meeting planners is the San Mateo County Event Center, conveniently located within minutes from over 5,000 hotel rooms. Comprising 48 acres and seven buildings (just minutes from more than 5,000 hotel rooms and the San Francisco International Airport), the event center campus houses the 104,990-square-foot Expo Hall Buildings; the 34,200-square-foot Fiesta Hall, with space for 2,280 people; the Jockey Club and Cypress Hall, each 15,680 square feet and offering space for 1,056 people; 14,000-square-foot Redwood Hall, with space for 466 people; and Sequoia Hall and Meeting Pavilion, each 6,500 square feet and offering space for 350 people. After or in between meetings, delegates can explore the center's four acres of lush outdoor space, as well as unwind in the on-site Jockey Center, which features 80 high-tech televisions showing off-track horse racing. Another venue, the South San Francisco Conference Center, is located closer to downtown San Francisco and offers state-of-the-art technology and 20,600 square feet of meeting space. San Mateo features a number of special event venues and activities perfect for group events and gatherings. Groups can hold events at the 53,000-square-foot Hiller Aviation Museum, home to more than 50 aircraft exhibits and several private event spaces, including its 8,640-square-foot Atrium, 27,600-square-foot Gallery and 40-person Doyle Conference Room. For events with an interactive touch, CuriOdyssey is an ideal group destination for exploration and learning, as it features a number of hands-on science exhibits and animal habitats. Groups can gather in the 350-person Redwood Hall or rent out the entire facility, which includes access to 1.3 acres of gardens, exhibits and optional animal encounters. Situated in Redwood City, Broadway by the Bay's Fox Theatre is a 1929-built theater set within walking distance of dozens of restaurants. Groups can hold events in such spaces as the theater's 240-person VIP Lounge, 3,700-square-foot Main Lobby and 516-person balcony, as well as rent out the entire 1,300-person theater for a private show. Located a short distance away in San Francisco's Golden Gate Park, the California Academy of Sciences is a world-class scientific and cultural institution housed in a 400,000-square-foot building, complete with an aquarium, planetarium, natural history museum, four-story rainforest and a living room. The Academy offers 13 private event settings and accommodates up to 3,000 total guests in such spaces as its 4,800-square-foot African Hall, 5,900-square-foot open-air Piazza and 4,100-square-foot Main Lobby with its very own T. Rex skeleton. Also in San Francisco, K1 Speed is a state-of-the-art entertainment venue with a professionally designed racetrack that allows groups to race against the clock in high-performance, zero-emission, environmentally friendly, all-electric karts. In addition to full facility rentals, which include use of the track, 4,000-square-foot lobby and 1,500-square-foot Pit Cafe, groups can gather in K1 Speed's two 735-square-foot meeting rooms, which offer full audio-visual capabilities. San Mateo County has long been a place of commerce and wealth. First inhabited by the Ohlone Indians, who lived in the area for at least 4,000 years before explorers arrived on the Peninsula in 1776, San Mateo opened free trade after Mexico's independence from Spanish rule in 1822. San Mateo became a stagecoach stop in 1841 and a railroad destination linking San Francisco and San Jose in 1861. The opening of railroad service attracted many wealthy San Franciscans to the San Mateo area, which quickly became a place for summer and weekend homes and a resulting population largely made up of those employed in the service of those homes. Today, San Mateo County is home to a number of performing arts companies, shopping areas and fine restaurants, all perfect stops for both business and leisure travel. These include Foster City's Hillbarn Theatre, one of the six oldest continuously operating amateur theater companies in the United States, as well as the oldest company in the county. Pacifica Performances at Pacifica Center for the Arts showcases a range of music, dance, comedy, art and spoken words events in an intimate environment. Outdoor lovers can delight in San Mateo County's mild climate with such attractions as the San Mateo Arboretum and Japanese Tea Garden. One of the most ecologically diverse and affluent counties in the United States, groups can find plenty of ways to enjoy San Mateo County's striking landscape. The region is home to several sandy beaches, many of which are great for surfing. Half Moon Bay State Beach, Pacifica State Beach and San Gregorio State Beach serve as great spots for picnicking, fishing and camping. Back inland, visit the Japanese Tea Garden in San Mateo County Central Park, where a tea house, pagoda and winding pathways create a serene environment for relaxation. Or, enjoy the scenic beauty of the Crystal Springs Reservoir, located in the rift valley created by the San Andreas Fault. San Mateo County's culinary scene is one of global influences, farm-to-table approaches and fine-dining experiences. San Mateo's Attic serves modern interpretations of dishes from throughout Asia, prepared with local, sustainable ingredients and alongside artisan crafted cocktails. Those with a big appetite visit Espetus Churrascaria Brazilian Steakhouse, which offers unlimited Rodizio-style dining and a salad bar with 15 to 20 types of salads and a variety of hot dishes. Viognier specializes in California cuisine complemented by a selection of more than 1,700 global wines, while Spiedo Ristorante serves traditional rustic Italian fare crafted with local produce, fresh seafood and homemade pasta. Taking a modern approach to artisan Italian cuisine, Osteria Coppa features a regularly changing menu based on fresh offerings by local purveyors, artisans and farmers, serving handcrafted pasta, Neapolitan-style pizza, antipasti, house cured salami and more.